IMPORTANT - Restrictions on use Experience at top landing required. Please read the hazard notes! A large site giving plenty of room for all on a good day. Before you take off, you need to be confident you can top land because YOU WILL NOT LIKE the alternatives! Not a friendly site, unsuitable for unsupervised novice CPs. Haig Colliery Mining Museum. This is shown on both 1:25000 and 1:50000 maps as the museum just to the south of the parking area. From the A595 at the south edge of Whitehaven take the road for St Bees and Sandwith, then follow signs for Kells and the Mining Museum. Parking & take off are next to the Haig Mining Museum which is sign-posted. From the west side of Whitehaven town centre, drive up Rosemary Lane (on the left of the only multi-storey car park in town). This leads onto High Road, take the third right, Solway Road, immediately right, and immediately right again onto the Mining Museum Car Park next to the rugby field. Parking & take off are next to the Haig Mining Museum which is sign-posted. A print out of the Whitehaven street map from the site guide OS or Google maps may be useful. 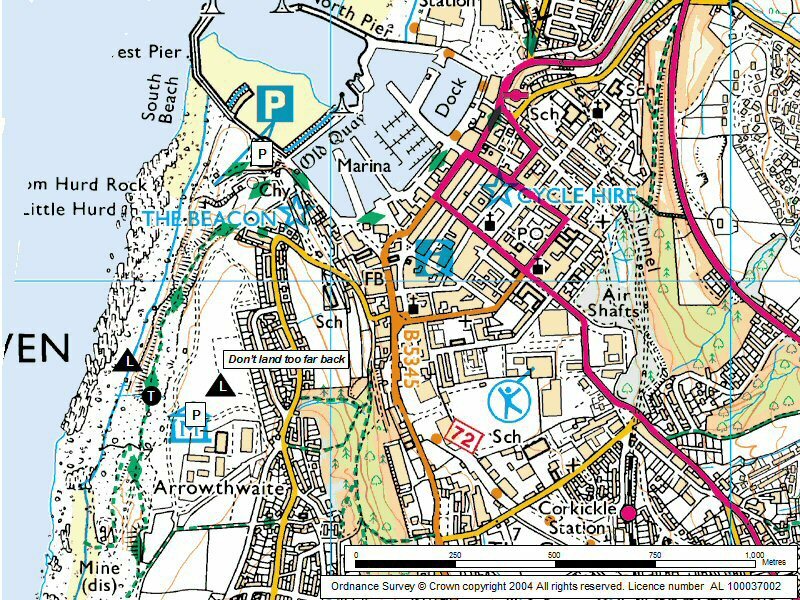 If you decide not to drive up to the museum, from the town you can drive along the southern side of the harbour to the car park at the end of the road, then carry your gear south. The tarmac path rises and goes around the obvious candlestick tower landmark, it's about quarter of a mile to the usual take off. Driveable or follow the description given. Not a friendly site and unsuitable for unsupervised novice CPs. When top landing, keep forwards towards the lip to avoid possible rotor, or land well back. There is a small terrace mid cliff in front of take off which can be slope landed; otherwise, if you get low, you are in the hands of Lady Luck! If going from the south bowl out along the sandstone cliffs to the St Bees lighthouse, constantly monitor your height and top land while it's still an option! THERE IS ABSOLUTELY NO LANDING AT ALL below the cliff top here. BE WARNED, the Haig tops the list for incidents at our coastal sites... it takes no prisoners and pilots have many scary tales! A flat grassy take off but with a public footpath to cross at the lip and a fence just down from the lip. Hence care and consideration required. Top landable for PGs and a lower option in front of take-off, if you haven't the height. Other than this, there are a lot of large boulders and water. It is not difficult to fly 3.2 km south to a large bowl. Going further it is a good idea only fly out to the lighthouse if you have just witnessed somebody returning successfully and you are an experienced pilot. If you attempt this, constantly monitor your height - top land while it's still an option, and beware turbulence behind the cliff spurs! St Bees is possible for the brave. There is a possible bottom landing halfway to St Bees at Fleswick Bay; but only if the tide is out! A general view of the Haig Pit site. As can be seen, the opportunities for bottom landing are extremely limited. Photo by Peter Rycroft. 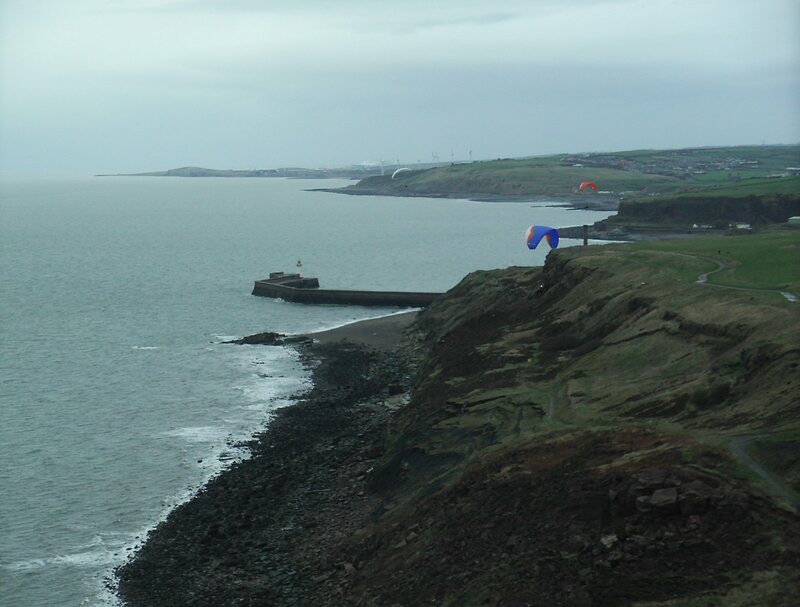 Notes : An out and return to St Bees main cliff take off point and probably the first crossing of Whithaven Harbour with a Paraglider. Gordie Oliver points out that the crossing is not recommended as it's "well dodgy".